A multimedia installation analyzing relationships and communication between people, inviting them to metaphorically see the point of view of “the other”. 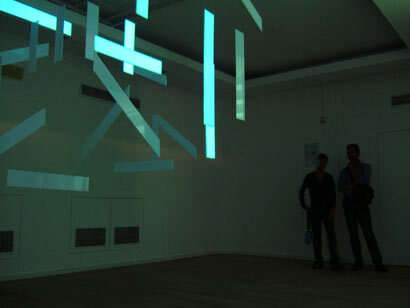 Each participant’s point of view is represented by a luminous display composed of a series of panels that burst into the space, dilating perspective. Panels create letters, words and phrases that express the character’s opinion. In order to understand the other person’s perspective, you have to position yourself in a precise point of the room to hear what the other person is saying and to understand his point of view. Authors: Francesco Meneghini (Italy), Ramon De Marco (Switzerland), Pedro Ferreira (Portugal).